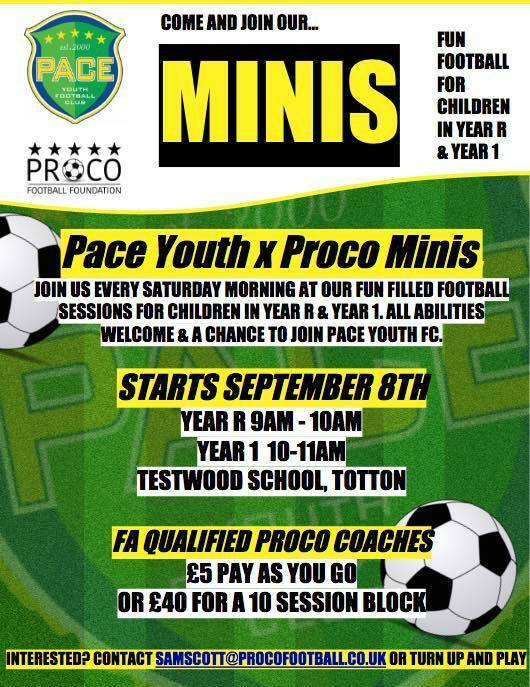 Welcome to Pace Minis, a FUN football session held for young players. We are looking to grow our Pace Minis groups. These fun football sessions cater for children, both boys and girls, who are in Year R – Year 1. The sessions are held on Saturday mornings at Testwood School, Totton (on the astropitch). Cost is £5 per session, pay as you go or £4 per session as a block of 10. All activities are based around having a ball at the feet of our new young players, playing games that will improve the ABC’s (Agility, Balance, and Coordination). Each session finishes with a series of round-robin matches to put those newly learnt skills into practice, followed by our player of the day presentation at the end. Bring along a drink and wear comfortable sports clothes. The progression and aim of the early sessions is to eventually develop and form teams to enter into the Mini Soccer Leagues at U7 (School Year 2) and become a Pace Player! If you would like to come along please get in touch.